The CR track focuses on the study of methods suitable to investigate clinical research topics. Students enrolled in the CR track are required to complete a combination of course work and clinical research. The competency domains include clinical and translational research, quantitative health skill, professionalism, communication, and interdisciplinary collaboration. Students will also develop the ability to identify and resolve ethical issues in clinical research, to ensure the safeguarding of human subjects, and to understand the workings of Institutional Review Boards and relevant organizational requirements. In addition, students will develop and/or increase their capacity in obtaining research funding from agencies such as the National Institute of Health (NIH) and others. The QHS track contributes to a field that requires specific analytic skills and is one that is currently lacking sufficient numbers of experts. Students enrolled in the QHS track will acquire skills in biostatistics and bioinformatics, and master the scientific principles and methodologies that underlie basic science, and clinical and translational research methods. In 2003, with Grant R25 RR019321, entitled, “Clinical Research Education and Career Development (CRECD) in Minority Institutions” the department established a curriculum to support a track in Clinical Research under the umbrella of the Master of Science in Clinical and Translational Research at the University of Hawai‘i (UH) John A. Burns School of Medicine (JABSOM). This educational program was expanded with Grant U54 MD007584 (NIMHD/NIH) and Grant U54 RR026136 (NCRR), “RCMI Multidisciplinary And Translational Research Infrastructure eXpansion, (RMATRIX),” containing a Multidisciplinary Research Education, Training, & Career Development Key Function that emphasizes education and training in research methodologies addressing health disparities and other translational health initiatives in Hawai‘i. Consistent with the National Institutes of Health (NIH) priorities, the program provides our multidisciplinary clinical-translational scientists and supporting staff with the knowledge, training, and career development skills needed to apply the best scientific strategies towards addressing targeted select HEALTH Initiatives (Cardiovascular, Respiratory, Cancer, Perinatal Growth & Development, Neurocognition & Aging, and Nutrition & Metabolism). These HEALTH Initiatives represent some of the most pressing health care needs of our communities. In addition to offering knowledge and skills needed for careers in clinical and translational research, the program functions as a supportive mechanism for newly trained investigators, actively facilitating career development and encouraging research collaborations, particularly those related to health disparities research. By providing high quality training to doctoral and post-doctoral candidates, the program aims to increase the critical mass of clinical and translational research at UH, including its minority investigators. Targeting junior faculty, fellows, residents, and doctoral candidates from biomedical sciences, nursing, social work, psychology and public health, the interdisciplinary nature of the program broadens students’ perspectives and increases opportunities for innovative, cross-disciplinary collaborations in clinical and translational research. Graduates of the program pursue research and research support careers in academia, government laboratories, healthcare organizations, and pharmaceutical companies. Regarding long-term career outlook and job opportunities for program graduates, the Bureau of Labor Statistics predicts that the employment in clinical and associated research will grow overall by 8% in the US. The State of Hawai‘i projects a higher, 34.8%, growth rate in medical scientists, and a 13.9% growth rate in computer and mathematics-related occupations by 2020. 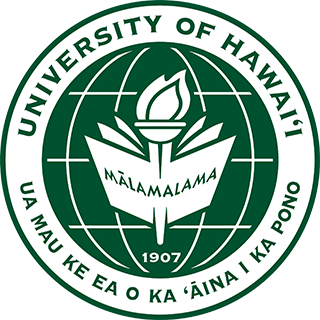 Please visit the University of Hawaiʻi at Mānoa Office of Graduate Education website to either fill out an online application or download a PDF form to submit. If the student fails the qualifying examination, the failed sections or the entire exam may be repeated once within 6 months of the first exam. A student who fails the qualifying examination a second time will be dismissed from the graduate program and the Office of Graduate Education. The format of the written thesis proposal will be specified by the thesis committee, but should follow the general format of a grant proposal to a federal funding agency (e.g., NIH), including project summary and relevance, background and significance, specific aims, research design and methods, and preliminary studies. Note: Depending on the nature of the research project, the student may need to obtain specific certification, approvals, and guidance as required, e.g., Committee on Human Studies (www.hawaii.edu/irb/)[Phone: (808) 539-3955]; Environmental Health & Safety Office (www.hawaii.edu/ehso/)[Phone: (808) 956-8660]; Institutional Animal Care and Use Committee (www.hawaii.edu/ansc/IACUC/)[Phone: (808) 956-4446]. If the student passes the comprehensive examination, the Advance to Candidacy Form (Form II) can be submittted to the Office of Graduate Education (OGE). UHM Form II can be found at the website https://manoa.hawaii.edu/graduate/content/forms. If the student fails the comprehensive examination, the failed sections or the entire exam may be repeated once within 3 months of the first exam. A student who fails the comprehensive examination a second time will be dismissed from the graduate program and the Office of Graduate Education. Once the student has successfully passed the final exam, the Thesis Evaluation Form (Form III), a certification of the final oral exam and thesis defense by the thesis committee, can be submitted to the Graduate Division. With the approval of the written thesis by the thesis committee, the thesis submission form (Form IV) can be submitted to the Graduate Division. Both UHM Form III and Form IV can be found at the website https://manoa.hawaii.edu/graduate/content/forms. Students must pass all sections of the exam at or above 80%. Note: Depending on the nature of the research project, the student may need to obtain specific certification, approvals and guidance as required, e.g., Committee on Human Studies (www.hawaii.edu/irb/) [Phone: (808) 539-3955]; Environmental Health & Safety Office (www.hawaii.edu/ehso/) [Phone: (808) 956-8660]; Institutional Animal Care and Use Committee (www.hawaii.edu/ansc/IACUC/) [Phone: (808) 956-4446]. Once the student has successfully passed the final exam, an MS Graduate Program Memo, indicating the student's successful completion of the MS Plan B, will be submitted by the graduate program chair to the Office of Graduate Student Services. Prerequisites: All students are required to have a background of undergraduate courses in biology and mathematics. At least one semester of undergraduate level biology and one semester of pre-calculus course are required. * Enrollment in this one-credit seminar each semester for A-F grade is required for the first year. ** Plan A requires that at least 6 research credits are from BIOM 700. To be selected by the student and his/her thesis advisor and committee according to the student's interests and needs (Please see UH Manoa graduate catalog for additional and updated course listings). BIOM 640 Introduction to Clinical Research (3) Instruction in developing clinical research questions and creating a concise protocol that includes a literature review, study design, subject recruitment and sampling, instruments, other measures and bioinformatics, sample size, consent form, budget and timetable. A-F only. Pre: consent. BIOM 644 Translational Research Methods (2) Lectures focus on translational research methods through selected genetic and acquired diseases including cancer, neurodevelopmental, inflammatory-immune and metabolic disorders with insight into analyses of DNA, RNA, genomics-proteomics, cell and animal models, and advanced imaging. A-F only. Pre: consent. BIOM 645 Clinical Protocol Development (3) Provides training in proposal development. Governance structures of funding agencies; funding opportunities and decisions; review processes; NIH application and processes; reading RFAs; compliance issues; cultural sensitivity; and types of questions using databases are addressed. A-F only. Pre: consent. BIOM 646 Clinical Research Seminar (1) Provides overview of research related to health and health disparities in Hawai'i. Seminar topics include ethnic disparities in health research, Native Hawaiian health, childhood research initiatives, fitness and obesity, social and cultural factors and ethics. Repeatable six times. A-F only. Pre: consent. BIOM 654 Medical Genetics (2) Lectures focus on heritable disorders, genetic mechanisms, patterns of inheritance, phenotype-genotype correlations, genetic/environmental factors, clinical diagnoses, genomic and precision medicine. A-F only. Pre: consent. BIOM 699 Directed Research (V) Students may register on approval of department. CR/NC only. Repeatable unlimited times. BIOM 700 Thesis Research (V) Research for master's thesis. Repeatable unlimited times. CR/NC only. Pre: consent. QHS 602 Biomedical Statistics II (3) Advanced biomedical statistics principles and tools as well as their applications will be introduced. Topics include: model selection, hierarchical model, repeated measurements, classification methods, structural equation modeling and multivariate analysis. A-F only. Pre: QHS 601 or consent. QHS 611 Bioinformatics II (3) Focuses on bioinformatics approaches for functional genomics related to DNA, RNA, and protein. Provides overview of virus, bacteria, and human genome and bioinformatics approaches to human disease. A-F only. Pre: QHS 610 or consent. QHS 620 Introduction to Clinical Trials (2) Introduction to clinical trials. Topics include history, definitions/terminology, adverse events, FDA and government regulatory agencies, ethics, monitoring committees, recruitment, introduction to protocol development, basic designs. A-F only. Pre: consent. QHS 621 Design and Analysis of Clinical Trials (2) Basic and advanced statistical methods utilized in clinical trials designs, conduct, and data analyze. Topics covers statistician’s role in drug development and DSMB, statistical theory in phase I-IV clinical trial designs and analysis. A-F only. Pre: QHS 601 or consent. QHS 650 Secondary Data Analysis (2) Allows students who are new to using secondary data to become comfortable with accessing the data, forming hypotheses, and designing study proposals. It will introduce by examples both basic and advanced techniques. A-F only. Pre: consent. QHS 651 Secondary Data Analysis Practicum (2) Introduces students to issues in working with complex data sets and add the hands on experience needed to conduct individual research using secondary databases. A-F only. Pre: QHS 601 and QHS 650 or consent. QHS 699 Directed Research (1-3 credits) Introduction to issues in working with complex data sets and add the hands on experience needed to conduct individual research using secondary databases. CR/NC only. Pre: consent. Demonstrate proficiency in written and verbal communication skills as required in various professional duties, including manuscripts for publication, grant applications, and conference presentations. Table. Alignment of CTR Program-specific objectives and learning indicators with the UHM Advanced Degree Institutional Learning Objectives (ILOs), Version 8 (UHM Senate approved Sept 20, 2017). Limited and selective program graduate and research assistantships are offered by the Department of Complementary & Integrative Medicine (CIM) to outstanding MS students, usually during their second year of study. The CIM Admissions and Awards Committee administers the departmental GAs for students to work at department-operated school facilities and units, such as Biostatistics Core or Bioinformatics Core. Teaching Assistantship (TA): Usually a 9-month appointment during the academic year. Specific duties vary, but they generally consist of serving under the supervision of a faculty member to assist in the teaching of a course. Research Assistantship (RA): In general, a RA supports the research and service activities of a faculty who is the principal investigator of a funded project. The specific duties of a RA vary depending on the needs of the project and on the qualifications and ex­periences of the RA. The duties may be directly or tangentially related to the RA’s program of study, while results from the research project may be incorporated into a thesis or dissertation as relevant. Some RAs exercise a great degree of inde­pendence while performing their duties; others carry out specific tasks that leave little room for independent judgment. RAs should be knowledgeable about official university policies on research and publi­cation. RA appointments usually have an 11-month appointment. Compensation: GA compensation adheres to the schedule (based on 0.50 FTE per year) approved by the UH Board of Regents. Newly appointed GAs/RAs are compensated at a pay step recommended by the department or unit of hire. GAs/RAs with research duties are usually appointed at pay steps depending on their qualifications and experiences, the needs of their departments or units, and the availability of funds. Tuition Exemption: GAs with 0.50 FTE appointments may receive a full tuition exemption. New GA with 11-month appointment must be employed for at least 12 weeks during the first se­mester in order to receive the tuition ex­emption. Tuition exemptions apply only to fall and spring semesters, and may not be used for Outreach College and Dis­tance Education courses. Summer Ses­sion tuition exemptions, when available, are issued by the Outreach College. GAs are responsible for the payment of fees. GAs who resign before serving at least three-quarters of a semester are liable for repayment of tuition exemptions. Health Plan & Parking Permits: GAs with 0.50 FTE appoint­ment who serve for a mini­mum of three months are eli­gible for health plan benefits. For more information, contact the personnel officer in the department or unit of hire. To purchase parking permits, GAs need to obtain first a memo from their department or unit of hire. They then pres­ent the memo along with all other required documents to the Parking and Transportation Services. A limited number of merit-based Graduate Division Achievement Scholar­ships are available to qualified graduate students. Eligibility & How to Apply: To be eligible, a student must be a student in the master’s program and have a cumulative GPA of 3.8 or above. Students apply through the MS graduate programs. These awards are very competitive. Award Amount: The award amount varies, depending on the purpose of the award and funding availability. Minimum award is $500. Award Conditions: Award recipients must maintain an enrollment of six credits or more of degree-related courses and a cumulative GPA of 3.8 or above, for the entire period of the award. If the student becomes ineligible for this award prior to the start of a term, he/she will forfeit the award and future terms of award application may be affected. Award Distribution Procedure: The Office of Graduate Education allocates achievement scholarships to graduate programs, which in turn distribute the awards to qualified students via BANNER and STAR at the time of registration.